Calling all Beacon Hill Artists! We’re investigating starting an Arts Council for our neighborhood. While there are some artists groups up here on the hill, there is none willing to tackle the issues of how to schedule and promote the Lander Festival Street. We also want to promote other arts-related events up here on Beacon Hill—how about a craft market, or an outdoor cinema? And we want to create a forum for artists and musicians to share information: about grants, shows, projects, and ideas. Our first meeting will be next Monday, March 1, 6:30 at the Beacon Hill Library (2821 Beacon Avenue South). If more discussion is needed after the library closes, we’ll have to retire to our friendly neighborhood pub! Let me know if you’d like to be included in future events but can’t make the meeting. One thing we’re trying to do up here is start a Beacon Merchants Association. This would replace the Chamber of Commerce which is essentially defunct. Better communication among existing businesses could help them and the greater community. We’re just in the process of forming, having had one preliminary meeting. Our next meeting will be this Friday at noon at Baja Bistro (2414 Beacon Avenue South). Our intent is to capture home businesses as well, so if you’re a business owner drop by to get more info and contribute your ideas. Anyone wanting to be added to the list can contact me directly. You can reach Robert at roberthinrix@gmail.com. The North Beacon Hill Council’s March meeting will include a presentation from Findlay Church regarding the development at 14th and Bayview. Another presentation will be given by the Department of Planning and Development regarding proposed new development guidelines for the City of Seattle. 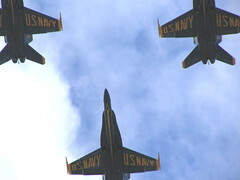 The Blue Angels fly directly over North Beacon Hill during Seafair. Photo by Wendi. It’s almost Seafair time, so it’s time to be prepared for the noise and distraction of Blue Angels flying directly over Beacon Hill. July 31: 1:20 p.m.-2:30 p.m.
August 1: 1:20 p.m.-2:30 p.m.
August 2: 1:20 p.m.-2:30 p.m.
Last week’s commentary by Frederica Merrell about small business owners and the planning process generated some interesting comments, including information about how local businesses can apply for the 2009 Mayor’s Small Business Awards, and discussion about how local businesses can get their concerns heard. Neighbor Brook commented, “In most other neighborhoods, they’d get a fair say because at least some of them would be involved in an active neighborhood chamber of commerce that would contribute to planning, go after development grants, and such. I’m sure it’s a challenge in a neighborhood as diverse as ours, but everyone is losing out without an organization like that.” The Beacon Hill Blog has commented on this concern previously. “Has there been any discussion among folks about how to cope with the RPZ when going on vacation? We’re taking a road trip in one car, trying to figure out what will happen with the other one while we are gone… Yes, we could tackle the issue that multiple cars is a bit excessive, but we’d be in the same boat if we had one car and took link to SeaTac. Not that it wasn’t illegal to leave a car for more than 72 hours before the RPZ, but… with actual parking patrols happening up here, we are realizing we can’t just blissfully leave a car on the street while we travel. Have any ideas or suggestions for Gracie? Please post them in the Forum. Today Mayor Greg Nickels presented funding awards totaling $128,384 to 22 Neighborhood Business District Associations throughout Seattle to continue the city’s investments in building healthy communities and supporting our local economy. Some of the projects funded include the creation of new business organizations, business district promotion (branding, marketing campaigns, farmers market start-up), physical improvement and enhancement projects (leaf clean up, curb bulb landscaping and banners), etc.